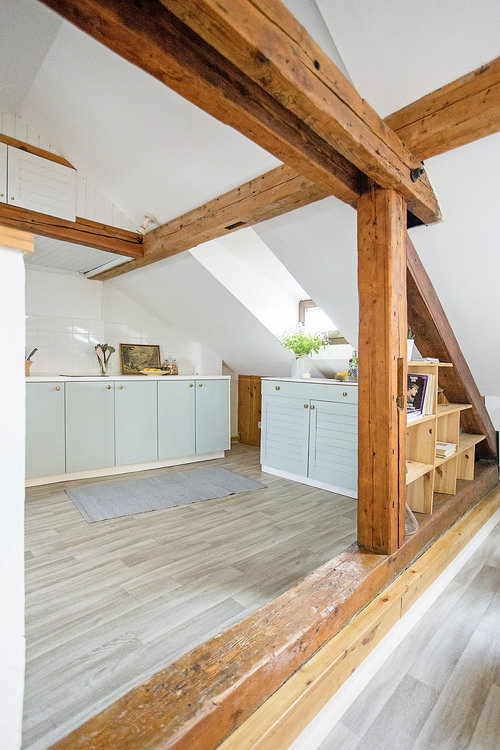 Would you believe that a dusty, forgotten, and perhaps unruly attic space can be turned into something wonderful overnight? Even less, actually! 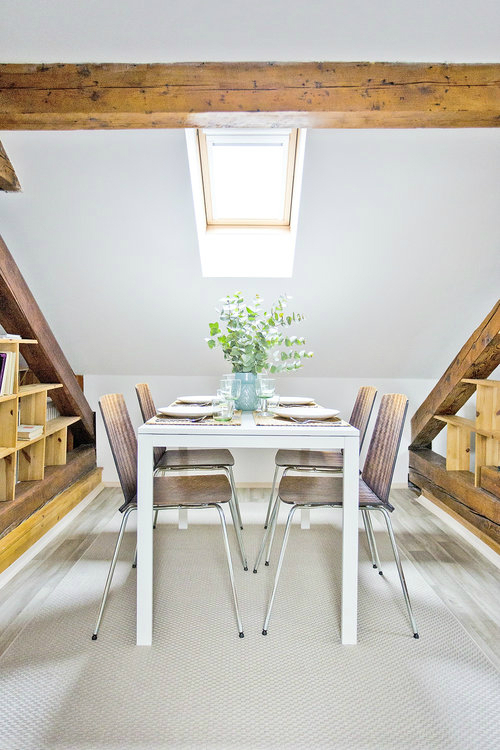 Ten hours was all it took to almost magically transform this Mala Strana attic space into a lovely apartment within a relatively small budget. A sliding barn door wall opens up to a whole new world of tremendous space. 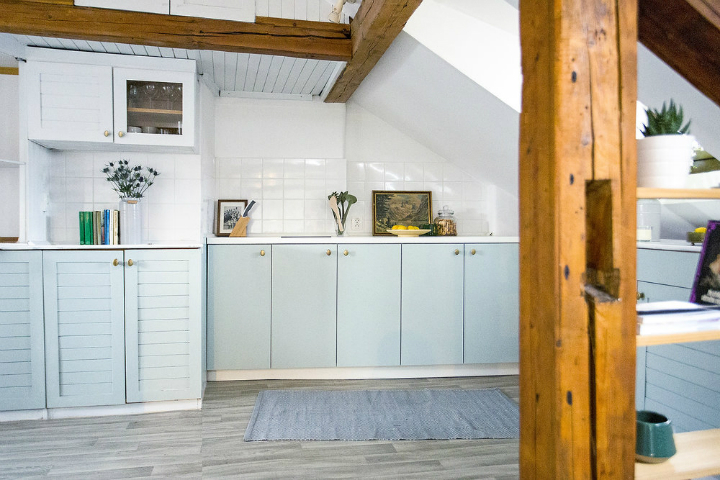 Once old and uninviting, the attic is now a place that’s welcoming, warm and cozy with a rustic feel. 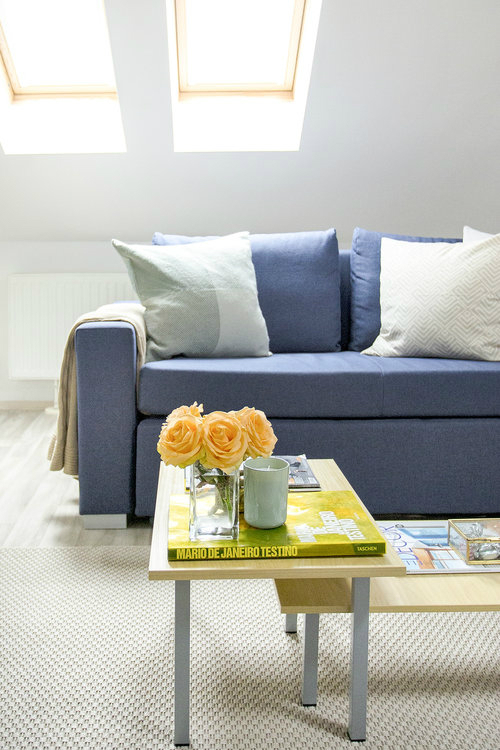 The surroundings are made up of neat and pristinely white walls and ceilings, while the light-toned flooring which is mostly covered in neutral rugs are brightened further by the sun’s rays. The kitchen is a beautiful sight with a square-tile white backsplash and countertops atop dainty colors of cabinetry. Plain countertops are brought to life with line patterns on the cabinet doors and ceiling, and the addition of personal pieces such as small frames and a collection of books. The dining area features a white square table matched with sleek and stylish chairs in a dark brown hue. It’s perfectly situated under the roof window, where the plantlife cradled by an elegant vase makes for a great centerpiece as it soaks under natural light. Set across the bed is a blue couch arriving in a much darker shade of blue, complemented by modern pieces of furniture and a large mirror on one side. An eames chair, the symbol of today’s modern home, holds a nice and soft throw which provides additional comfortable seating whether as visitor, dining, or rocking chair. 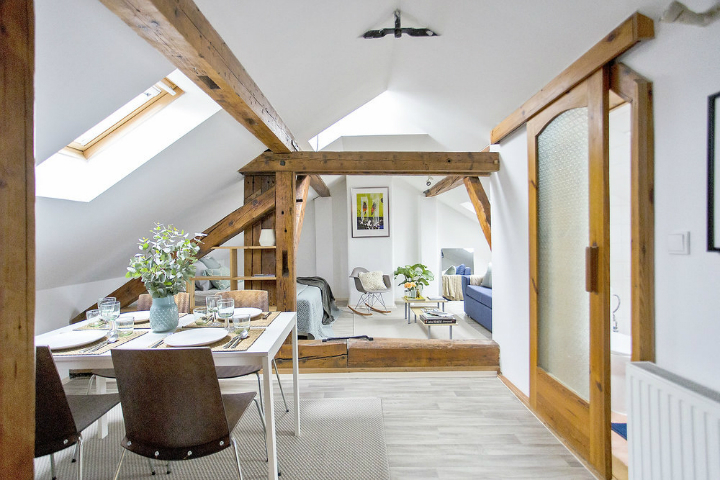 Huge wooden beams not only support the attic with great strength, but grace a compelling interior style as it exposes the rich structural elements of the home. 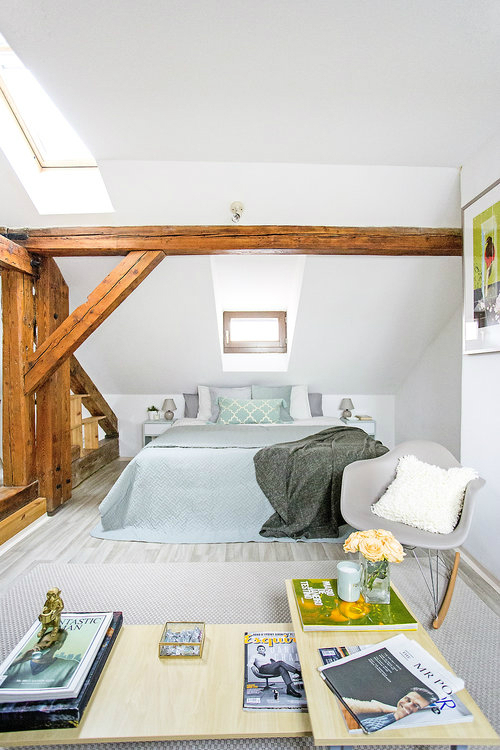 What’s more remarkable is how shelving have been incorporated seamlessly into the beams for a less cluttered space.